Will Utahn&apos;s idea help Darwin&apos;s finches save themselves? Conservation • Birds weave pesticide-laced cotton balls into nests, killing blood-sucking maggots, University of Utah study finds. Courtesy image | Sarah Knutie, University of Utah A finch in Ecuadorís Galapagos Islands pulls a cotton ball from a dispenser set out by scientists. A University of Utah study showed that when the cotton is treated with permethrin ñ a mild pesticide used in human head-louse shampoo ñ and the birds use the cotton in their nests, blood-sucking fly maggots are killed, thereby protecting the finches and their offspring that often fall prey to the maggots. Courtesy image | Sarah Knutie, University of Utah This finch nest in the Galapagos Islands was built with cotton the bird collected from dispensers of cotton balls treated with a mild pesticide.. A University of Utah study found that Darwinís finches on Ecuadorís Galapagos Islands will collect the cotton balls and use them in their nests, killing parasitic nest fly larva or maggots that kill finch nestlings and their mothers. The method might be used to protect birds and mammals afflicted by parasites. Courtesy image | Nick Steffens, University of Utah Marketing and Communications University of Utah biology professor Dale Clayton and doctoral student Sarah Knutie conducted a study showing that finches in Ecuador's Galapagos Islands will collect cotton balls treated with a mild pesticide and use them to build their nests, killing parasitic fly maggots that often kill baby birds. Here, Knutie holds one of the cotton dispensers. The method might provide a way to help protect threatened or endangered finches, other birds and even small mammals. 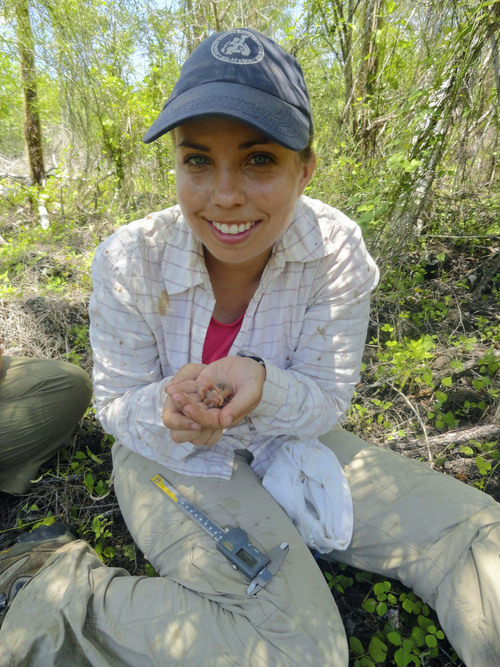 Courtesy image | Emily DiBlasi, University of Utah University of Utah doctoral student Sarah Knutie holds finch nestlings she studied while in EcuadorÌs Galapagos National Park. 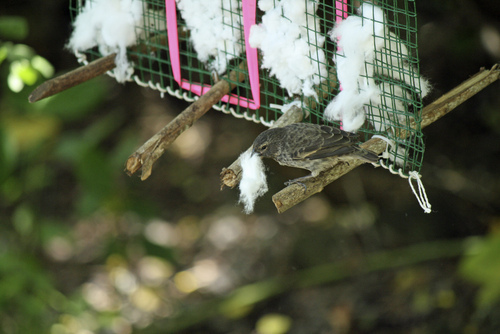 She ran a study showing that mother finches can self-fumigate their nests by picking up cotton balls treated with a mild pesticide. The chemical kills parasitic, blood-sucking nest fly maggots, increasing the survival of the baby birds. Courtesy image | Sarah Knutie, University of Utah When University of Utah biologist Sarah Knutie saw finches like this pulling frayed fibers from a laundry line to carry off and use in building their nests, it made her wonder if the birds would collect cotton balls treated with a mild pesticide as a way to wipe out parasitic nest fly larva that kill baby birds. She did a study and showed the method works, holding promise for a new approach to saving threatened birds and perhaps mammals afflicted by parasites. Galápagos Islands scientists are in a race to preserve the endangered and iconic Darwin&apos;s finches, the inspiration for Charles Darwin&apos;s theory of evolution by natural selection. And University of Utah researchers have discovered a possible fix for a theorized source of their decline: pesticide-treated cotton balls that the finches weave into their nests, safeguarding their babies from the blood-sucking fly maggot, Philornis downsi. 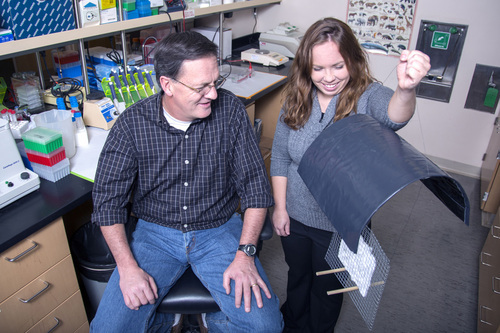 "We are trying to help birds help themselves," says U. biology professor Dale Clayton, senior author of a study outlining the self-fumigation technique published Monday in the journal Current Biology. It&apos;s an elegant solution for a uniquely vulnerable group of birds, some of whom live in trees too high to be easily sprayed. Fewer than 100 mangrove finches remain on Isabela Island, and only about 1,620 medium tree finches exist, all on Floreana Island. But it may be used to help other endangered birds and even some mammals, Clayton said. As with most discoveries, inspiration came through observation. 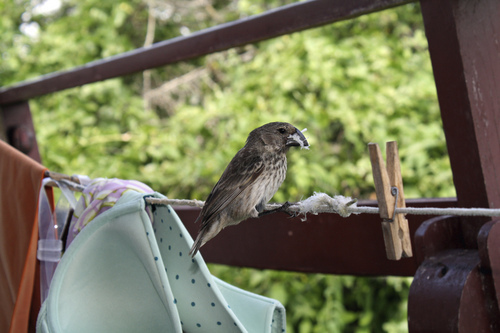 On an afternoon in 2010, U. doctoral student Sarah Knutie was sitting on the balcony of her dorm room at the Charles Darwin Research Station and noticed finches were grabbing frayed cotton fibers from her laundry line, presumably to incorporate into their nests. She was there with a team of U. scientists studying the toll exacted on the birds by Philornis downsi, a parasitic nest fly likely introduced to the Ecuadoran islands on ships from the mainland. The adult flies are a harmless nuisance, but they lay eggs in finch nests and the hatched larvae feed on nesting finches and their nestlings. "We were trying to understand the degree of the problem with these flies, which varies from year to year based on many factors that we don&apos;t really have a grasp on," she said. "The population of the fly is higher some years, but in some seasons 100 percent of the infested finch nestlings die." The team had successfully treated nests with a mild pesticide, permethrin. "We would climb into the nests and remove the nestlings and spray the lining of the nests using an old hair spray bottle," said Knutie. "But it was time- and labor-intensive." Could the finches, she wondered, be encouraged to pick up pesticide-treated cotton balls and carry them back to their nests? Funded by the National Science Foundation, the U. and a crowd-funding campaign, the study was done January through April 2013 at the El Garrapatero field site on the Galápagos&apos; island of Santa Cruz. U. biologists built wire-mesh dispensers for the cotton and placed 30 of them at 40-meter intervals along a swath of land near nesting finches. Half the dispensers were filled with cotton treated with a 1 percent permethrin solution and half with water. Though similar in appearance, the cotton balls were distinguishable upon close inspection. Researchers checked each nest with a camera on a pole to confirm breeding activity. After the birds were finished breeding and had flown off, the nests were collected, the cotton weighed and the fly maggots counted. Preliminary experiments had shown the finches, which are territorial, travel no more than 55 feet from their nests to collect nest-building material. Also, they didn&apos;t favor untreated or treated cotton balls. For the final experiment, cotton balls were collected by four species of finches. Biologists found 26 active nests. None of the nests contained more than one type of cotton; 13 had permethrin-soaked cotton and nine had water-soaked cotton. 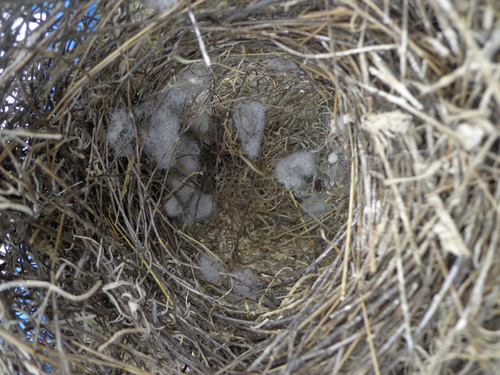 Nests with permethrin-treated cotton had "significantly fewer" parasites than those without, and nests containing at least one gram of treated cotton were virtually parasite-free, the study found. The research station is already putting the findings to work and, being cautious, laying out dispensers with untreated cotton, Knutie said. "It could be a few years before they add pesticide." There have been no studies of the long-term effects of the pesticide on the birds. But Clayton said there&apos;s no immediate harm, and when sprayed directly in the nests, the pesticide has been shown to increase nestling survival by 100 percent. "This stuff is harmless to birds and mammals. It&apos;s the exact same stuff used for kids with head lice. It interferes with the insect&apos;s nervous system, components we don&apos;t have in our nervous system," he said. "The more interesting question is whether the flies will evolve resistance, as human head lice have done." The merits and risks of interfering to manage and protect wildlife is subject to debate. Darwin&apos;s finch nests aren&apos;t the only habitats invaded by parasitic flies, which showed up in large numbers in the Galápagos in the 1990s. Knutie said the flies now infest all land birds there, including most of the 14 species of Darwin&apos;s finches, two of which are endangered. But the finches have no history with them and don&apos;t appear to have developed biological or behavioral defenses against them, she said. "Also, we think there are no natural predators of the parasite on the Galápagos." There&apos;s potential for these birds to go extinct within the next century and saving them has become a top priority in the Galápagos. "They are a major driver of eco-tourism. People go the Galápagos to see the finches that inspired Darwin," she said. Knutie said permethrin-treated cotton could be tried on flea-bitten Florida scrub jays, feather lice-infested honeycreepers or black-tailed prairie dogs in the Great Plains threatened by plague-carrying fleas. It has been used with nesting mice in the Northeast, but it was unclear whether it worked to kill Lyme disease-carrying ticks, she said.